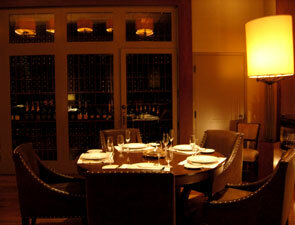 Nobhill Tavern is a fine dining establishment in the MGM Grand in Las Vegas. Even though it's off of a casino, once inside it evokes a very homey, San Francisco feel. To get the most from this inviting atmosphere, please read on for some valuable dining tips. Reservations are strongly recommended and can be made online via the Michael Mina Web site or the MGM Grand Web site, or by calling the restaurant directly. The restaurant seats about 90, with an additional 16 or so at the bar. Seats are nicely spaced, as are tables, which are appropriately spaced throughout the dining room. You're given many seating options, including stools at the bar, larger leather seats at a table past the bar, semi-private booths in the lounge and banquettes with double bolsters for added comfort in the main dining room. If you simply want a chair, you can choose armed or armless. There is something to suit everyone's seating desires. Tables for two are generous at about 30 inches in wide and longer in length. Lighting is romantic, though you shouldn't have any problem reading the menu. Light calming music plays throughout the restaurant, although it you want a more bustling atmosphere you can dine in the bar area. Even though there is a large bread oven in the main dining room, it is engineered in order to keep the heat from overwhelming those seated near it. As mentioned before, the service is fantastic; during our visit, everyone was so helpful and eager to please. They spend an extra minute at your table without being obtrusive. One server we had, who was particularly helpful, was Joshua. If you get a chance, ask for him; you won't be sorry. Restrooms are easily accessible and off of the main dining area. The restaurant claims to be wheelchair accessible, although there are two steps up at the front of the restaurant; there must be another way in for those customers in wheelchairs. The dress code is business casual; we've seen more casual early on off-peak evenings and more business on bustling nights. We recommend long pants for gentlemen. Complimentary valet parking and self-parking is available at the hotel, where cabs are also frequently available. Please note that if the end of your meal coincides with the end of a show at the MGM Grand, you most likely will have to wait in line for a cab. Nobhill Tavern has won multiple awards, including: AAA, Four Diamond Award, 2005 and 2006; Wine Spectator, Award of Excellence, 2003 and 2004; Las Vegas Life Magazine, Best Cocktail, 2002; James Beard Foundation, Best New Restaurant nominee, 2002; Las Vegas Life Magazine's Epicurean Awards, Best New Restaurant on the Strip, 2002.